Image created by Yasmine Sedky (@yazsedky).Recently I’ve noticed a change in Google search rankings. When I searched certain keywords, Twitter threads came up. So I tried adding keywords to clients’ social media posts to see if I could get their tweets to rank, increase brand awareness, and increase website traffic. I was almost surprised when it worked. Search engine ranking algorithms evolve faster than a zombie plague in a horror film – we all know this. Yet most business owners are barely keeping pace with what Google was doing two years ago. 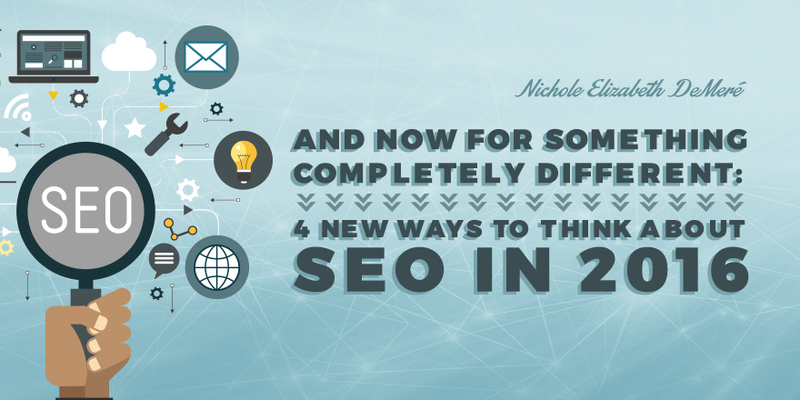 If you’re still thinking in terms of Pandas and Hummingbirds, let’s get you up to date for the SEO changes and challenges of 2016. In 2015, Twitter gave Google access to live data streams of their 284 million users, which means real-time tweets can and will show up on search engine results. You can build on this by promoting your Twitter activity, planning your tweets to include keywords and a link to your site, and using 1-2 relevant hashtags to increase engagement. I also like leveraging the power of images on Twitter, so I pair images I create on Buffer’s Pablo image creator with my Twitter content. Bottom line: Google’s indexing of Twitter is set to grow dramatically this year. Are you ready? Bottom line: You may not be able to see into the future, but Twitter can. So pay attention. Overt sales methods like traditional online ads and marketing emails are coming up against increasing resistance among consumers. One of Rand Fishkin’s 2016 predictions for SEO web marketing includes “entrenched players” trying to “legislate [ad blocking] away.” It won’t work, in my opinion, because adblocking programs aren’t the problem – they’re the symptom. A symptom of a population which has been sold to six ways ‘til Sunday and is over-sensitized. Another trend I’ve been seeing is people unsubscribing from marketing emails and newsletters, a reaction to the marketing dump that has become our inboxes. Bottom line: SEO is going to become even more important as a way for your ideal customers to find you. Because, if you try to find them first, they’ll ignore you. If you haven’t heard of DuckDuckGo yet, by the end of this year, you will. In 2015, this search engine grew by leaps and bounds and many early adopters in tech converted. Why are people switching? Big Brother Google is watching, but DDG bills itself (pun intended – get it? Bills? Ducks have them? Okay.) as “the search engine that doesn’t track you. A superior search experience with smarter answers, less clutter and real privacy.” What does this mean for SEO and web marketing? Consider it yet another reaction to a culture of constant selling. After all, if the search engine doesn’t track you, it can’t target ads at you either. Social media is becoming increasingly important as a tool for organic, inbound marketing. Organic, inbound marketing is becoming far more effective in the face of people blocking, unsubscribing, and outright rejecting blatant outbound/traditional marketing methods.